Early December was a busy time for Bing Thom. First, there was his 72nd birthday, followed shortly by an announcement that the renowned Canadian architect had won the competition to design the new Xiqu Centre in Hong Kong, the first of 17 cultural venues to be built in the West Kowloon Cultural District. But Thom looks nothing but energised the day after the announcement, as he stands inside the cultural district’s offices. “Have you seen the model?” he asks, bouncing over to a scale model to show off the 1,780-seat, US$350 million centre for Chinese opera that will begin construction this year. When it is completed at the end of 2015, the Xiqu Centre will contain a large theatre, a 280-seat teahouse, educational facilities for 200 students, retail spaces and a series of gardens. (A smaller theatre will be added later.) When Thom’s design was first unveiled, its undulating, translucent form caused quite a stir, earning comparisons to a lantern, a curtain being pulled open and even, in less polite corners of the internet, a certain part of the female anatomy. The Xiqu Centre is a sort of homecoming for Thom. Born in Hong Kong in 1940, he left with his family for Vancouver when he was ten years old. After studies in architecture at the University of British Columbia and University of California, Berkeley, he worked briefly for Japanese architect Fumihiko Maki before joining Arthur Erickson’s office in 1972, overseeing a number of major projects including the Roy Thomson concert hall in Toronto and the ambitious Robson Square civic centre project in Vancouver. Since opening his own practice in 1981, Thom has expanded cautiously, building up an eclectic portfolio of projects in that ranges from major concert halls and theatres to shopping malls, libraries and small community centres – all of them guided by a desire to create architecture that makes cities more humane, transparent and equitable direction. Thom is renowned for his research-intensive, hands-on approach and his attention to detail. That certainly seems true in the case of the Xiqu Centre. In collaboration with Hong Kong architects Ronald Lu and Partners, Thom’s firm is holding workshops with the local Cantonese opera community, and he seems deeply concerned about how his building will be adopted by both opera lovers and the general public. “You start as an empty vessel, you fill yourself up with all this information, and somehow in the analysis, the design comes from that,” he says. As the gateway to West Kowloon, though, the Xiqu Centre’s mission goes well beyond Cantonese opera. It’s a tricky site to work with, at the corner of two major thoroughfares in a disjointed patchwork of infrastructure, but Thom has a knack for animating unfriendly bits of landscape. As the Washington Post put it two years ago, “Thom has a habit of adopting places.” This is especially apparent in suburban Vancouver, where Thom’s design for a new Chinese mall, the Aberdeen Centre, bucked the car-oriented typology of its surroundings with a defiantly pedestrian-oriented, translucent building that seems to beckon passersby like a lantern. Another project, Surrey Central City, took a 1970s-era shopping centre and incorporated it into a new office tower and university campus, turning an unremarkable retail box into the centre of a burgeoning mixed-use neighbourhood. 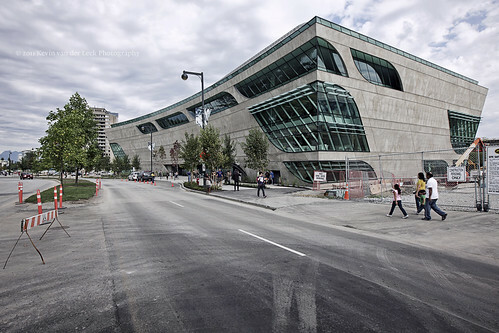 Nowhere is that sentiment more obvious than in Thom’s design for the Surrey City Centre Library, which opened in 2011. This is a building that is all about the space between the notes – it’s a library not as a repository of books, but as a gathering space for people in a digital age. Rather than the hushed silence of a typical library, Thom’s building is filled with the sound of conversation. It’s an eminently comfortable place to be, and it owes much of that to the way it harnesses natural light through ”curving walls, angled windows and vaulted skylights reaching upwards and outwards to pull in a surprisingly even cast of light to every corner and every one of its four floors,” in the words of critic Trevor Boddy. “When light comes into the building, it paints the building,” says Thom. “In each locale the quality of light is very different. In Vancouver we have a soft light, there’s a lot of moisture in the air, so in the colour there are always tints of grey. Whereas if you go to Texas, the light is very bright and harsh – it’s either all light or all dark. It affects people’s mentality, their perception of things.” As for Hong Kong light, ”there’s a softness to it, yet the sun is quite high and it’s coming through harshly, and there’s always this haze that creates glare.” The Xiqu Centre will be designed to work with that light much in the same way as the Surrey library, thanks to its translucent walls, which will resemble bead curtains when completed. At night, the light will be reversed, as it radiates out from the interior of the Xiqu Centre. “I set out to design a building that will beckon people in,” says Thom. If everything goes to plan, it would be an auspicious way to kick off the West Kowloon Cultural District. After all, there’s no culture without people – and there’s no good architecture without people to use it. This story appears in the February/March 2013 edition of Surface Asia. This entry was written by Christopher DeWolf , posted on Friday February 08 2013at 08:02 am , filed under Architecture, Art and Design, Asia Pacific, Canada, Heritage and Preservation, Interior Space, Public Space, Society and Culture and tagged Cantonese Opera, Hong Kong, Kowloon, Vancouver, West Kowloon Cultural District . Bookmark the permalink . Post a comment below or leave a trackback: Trackback URL.